I've launched these on their journey to Ohio, where they will meet and mingle with siggy blocks from 56 other people before selecting a representative to bring 56 blocks home to me. 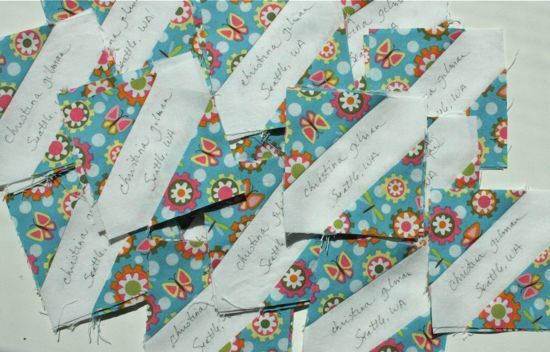 The end result: a quilt with the names and locations of all the 57 quilters participating in this swap! The blocks are easy to make. I'd love to find a better way of signing them, though, since my pen tends to catch and drag on the fabric a bit. Maybe a slightly fatter pen tip?